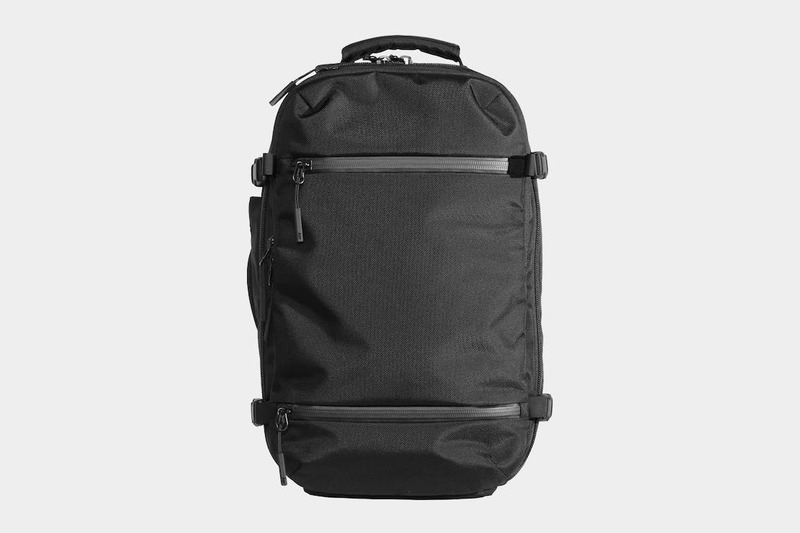 The Aer Travel Pack is a sleek & good looking—ideally suited for casual, one bag travel and urban adventure. Plus, it’s got some great pack organization. 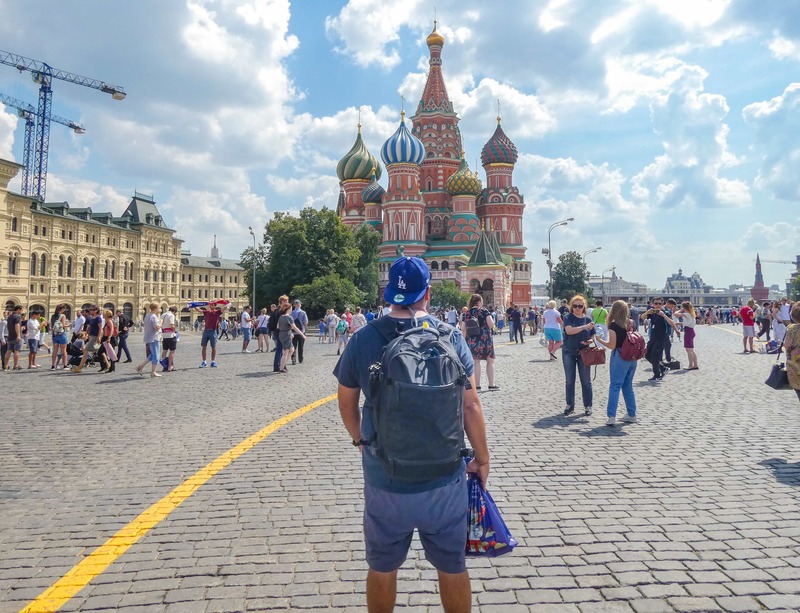 Aer has released an updated version of this pack, view our Aer Travel Pack 2 Review. Let’s start with the obvious on the Aer Travel Pack—this bag is beautiful. As far as travel packs go, this is one of the slickest we’ve seen, with clean lines, a well-rounded design aesthetic, and a low profile. 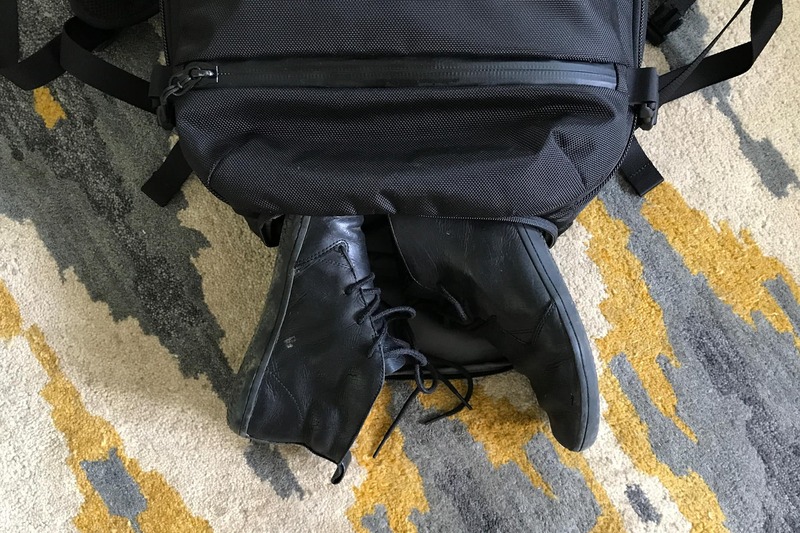 That low profile is due in large part to the compression straps that not only keep the bag closer to your back, but also make the bag feel lighter when you’re lugging a full load. Although strength and beauty don’t always go hand-in-hand, this bag is a perfect balance between the two thanks to 1680D Ballistic Nylon construction. 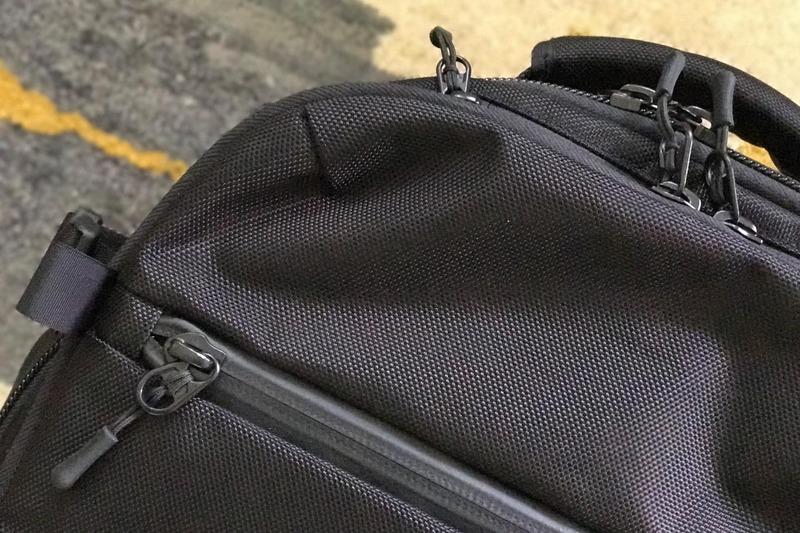 We’ve abused this bag quite a bit, and it still maintains a nice strong feel which leads us to believe it won’t leave you with an untimely rip, tear, or break. While the Aer Travel Pack isn’t advertised as waterproof, we feel pretty good about rating it as water-resistant/splash-resistant thanks to the use of water resistant zippers on the exterior. Now, you don’t want to go cliff jumping with this bad boy strapped to your back, but you should be OK during a 10–15 minutes bout of inclement weather…beyond that we have our doubts. As nice as they are, the water resistant zippers aren’t used on the entire backpack. 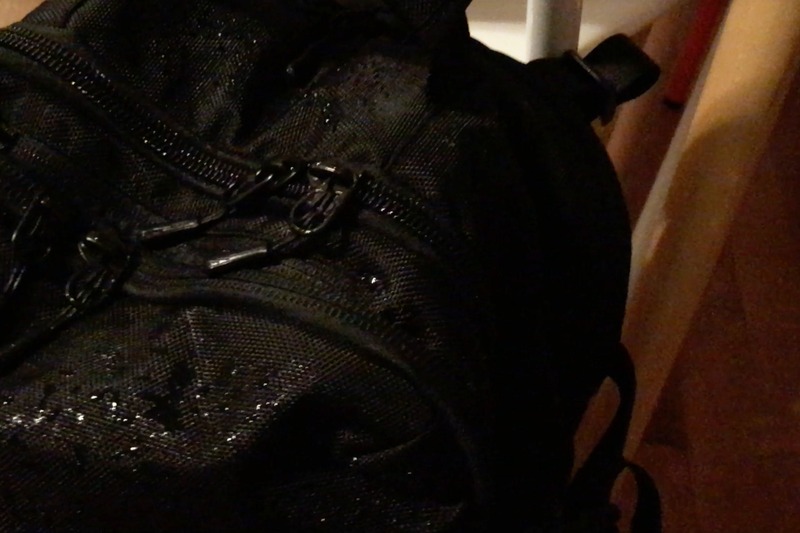 And when we tested the Aer Travel Pack in heavy rain, water definitely got inside. If you end up purchasing this bag, make sure you put your laptop in a sleeve to keep it dry (we recommend sleeves by Incase if you want something with a similar aesthetic to the bag). 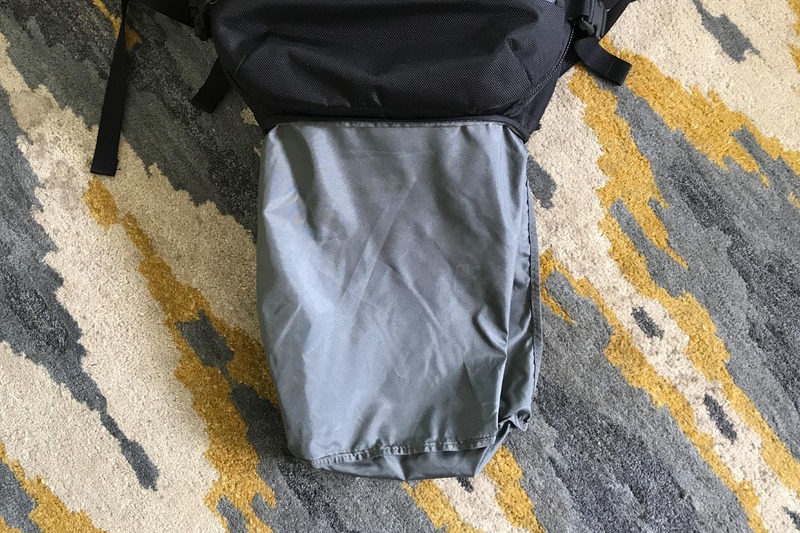 Let’s take a closer look at what the Aer Travel Pack offers, and what makes this bag unique. This is probably the one thing we love most about the bag—the standalone shoe compartment. For the adventurous traveler who isn’t afraid to get a little grit and grime on their shoes, the separate compartment makes keeping dirty footwear separate from all those carefully folded clean clothes a breeze. Plus, it folds out of the pack, making it easy to clean away any soil, sand, or dust that collects in the compartment. It is worth noting, Aer placed two ventilation holes at the bottom of the shoe compartment. It’s great for airing out those dirty, sweaty shoes. But not so great when you need to set your bag down in the rain. Note: whatever is in that compartment will likely get wet if you set it in a puddle, or something. Oh – and the pocket folds out easily for cleaning – because you know there’s gonna be some grime in there when you’re through with it. When it comes to air travel, few things are as miserable as dealing with security. 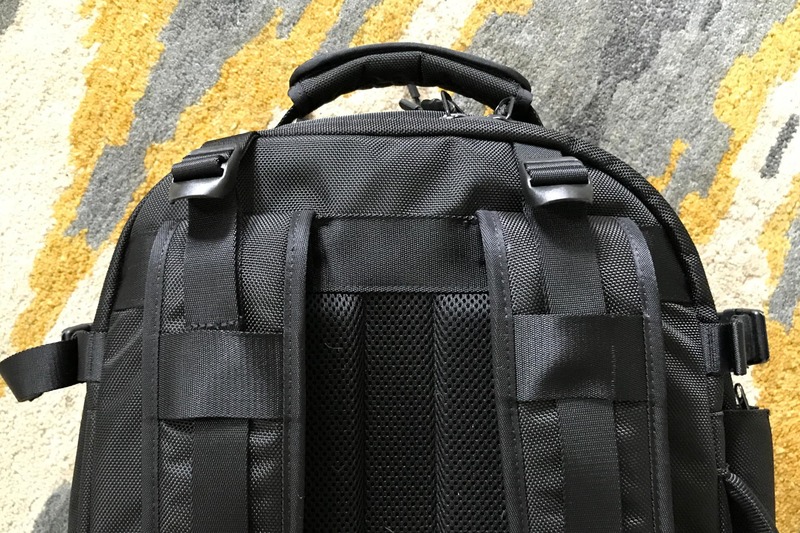 Anything that simplifies and expedites the process of getting through long lines, metal detectors, and x-ray machines is going to get a BIG thumbs-up from us, hence our love for the Aer Travel Pack’s padded top pocket. Perfect for quick grabs and quick unloads, this is a tough, zippered pocket for loose change, tickets, passports, wallets, sunglasses, and anything else you might want to keep handy. 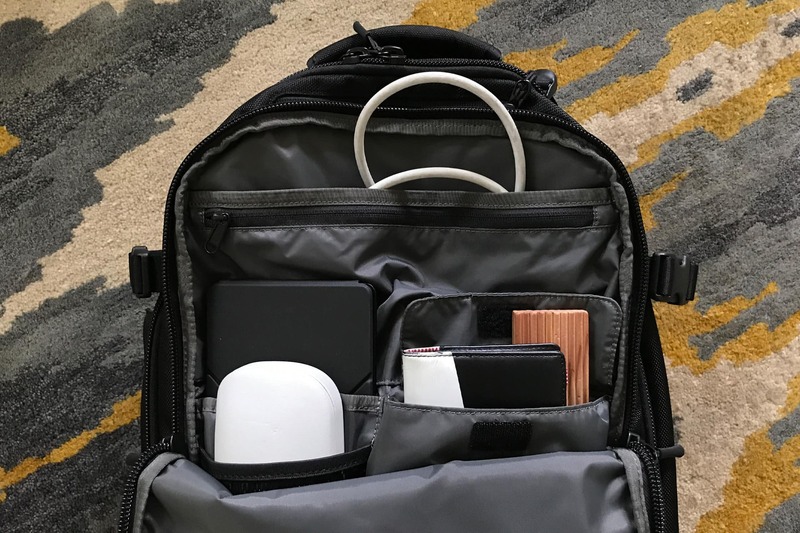 Plus, the location of the top-pouch makes it virtually impossible for pickpockets and other evil-doers to jack your belongings when walking through crowded marketplaces or busy streets. 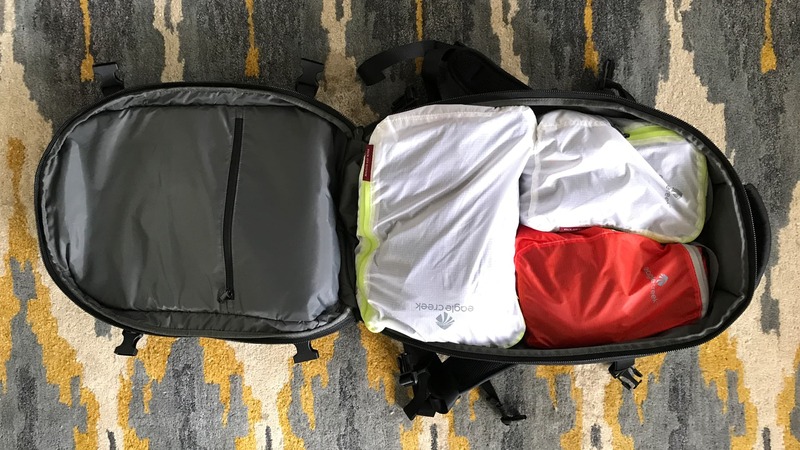 The main storage compartment of the Aer Travel Pack is a clamshell opening—usually our preference over a toploader as it makes organizing packing SO much easier. 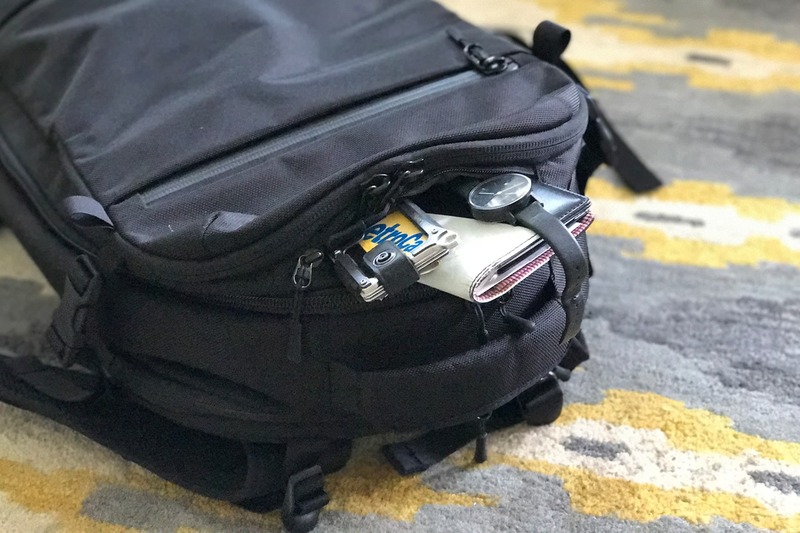 If organization is your obsession, this bag is definitely going to be your jam, with lots of little internal and external pockets for accessories like pens, paper, multi-tools, toiletries, memory cards, and more. While the pockets aren’t perfect (the padding inside some the internal compartments feels unnecessary, and the velcro pocket needs to perfectly align with the small velcro patch to close securely) they are ultimately nice to have. 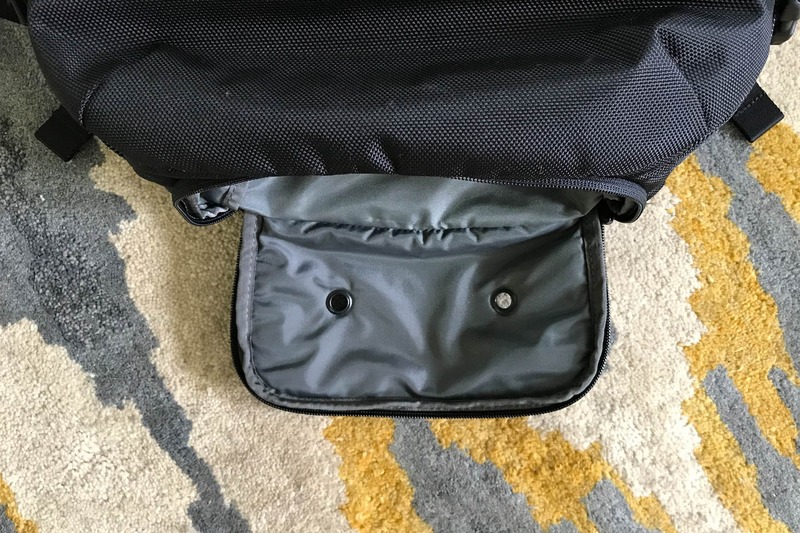 Our favorite pocket on the bag has to be the half pocket on the front of the bag which we found immensely helpful in terms of being a quick place to stuff a charger or a toothbrush. The lining has a swishy, windbreaker like feel which doesn’t really add any performance value to the bag, but it certainly is helpful for making cool sound effects. 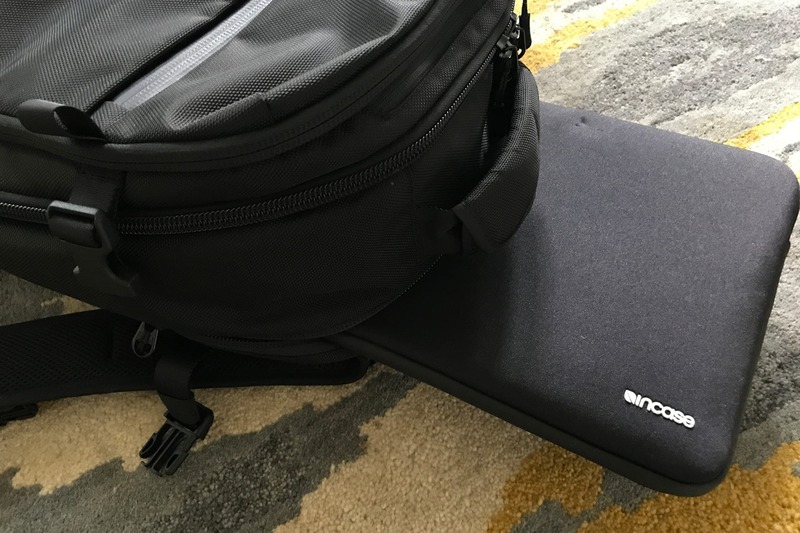 And—before anyone asks—yes, there is a fully padded and suspended laptop compartment, so your hardware stays safe when throwing your bag in frustration after the PA system announces another delay to your flight. (Don’t throw the pack though. Just don’t). As far as travel packs go, straps and pads are pretty important. And for the most part, the Aer Travel Pack gets it right in this department. Not only are the back pads really comfortable (seriously, you could almost use them as a pillow), they also leave room for airflow when the pack is being worn, giving your skin some much-needed breathability. And the side handle and top loop proved to be handy when you just need to grab the bag and move it a short distance. 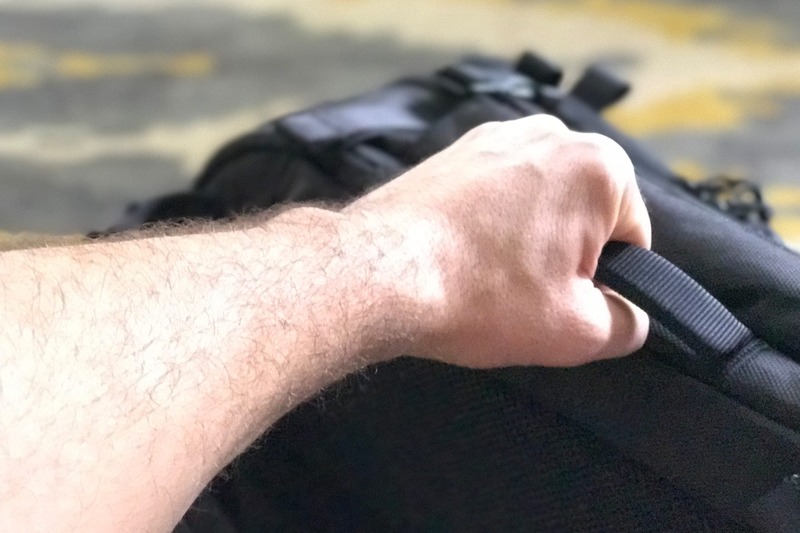 Having said all those nice things, there is a knock—the shoulder straps can be a little thin & uncomfortable if the bag is fully loaded, and might not be suited for hours-on-end wear – but – the multi-adjustable straps can mitigate some of that, allowing you to distribute the weight pretty well on your back. Pulled it out of the small box it came in and everything is looking & feeling great. Impressed with the design of the pack and considered pocket layouts. Bag itself is still going strong. Good durability and hasn’t shown hardly any wear and tear with daily use. Still going strong and we even ran this through the ringer with a trip to the 2018 World Cup. Still a great bag. Separate shoe compartment—perfect for keeping those mud-caked hiking boots away from your clean gear. In addition to being a theft deterrent, the padded top pocket makes getting through airport security a breeze. Compression straps give the bag a low profile when you’re walking around. When carrying a heavy load, the shoulder straps aren’t perfectly cushioned and can be a little uncomfortable. Velcro patches are small, requiring precise moves when closing flaps & straps—not ideal. Water can get inside the bag during rain - not all zippers are water resistant. Ultimately, the Aer Travel Pack is a rock solid bag for the average traveler and weekend warrior. It will do just fine on a photo tour of Berlin or a day-trip to Sydney’s Bondi Beach. As long as you’re not planning an adventure into the jungles of Borneo, the Aer Travel Pack should do just fine and then some.